Ask just about any serious gamer what’s in his backlog, and he’ll most likely start rattling off a list of games to you that he hasn’t played to completion for one reason or another – or quite possibly, games that he hasn’t even started. However, try digging a little deeper by asking what it means to have “completed” or “beaten” a game, or question how that status is earned on more open-ended games like sports games and you’re likely to get different answers from different people. To some, finishing a game may simply mean reaching the end of the story mode and seeing the credits roll. To others, it may require more than that – some won’t consider a game truly finished until all trophies or achievements have been unlocked. Still others may consider a game finished when they reach a point that it’s no longer fun for them to play. So who’s right? 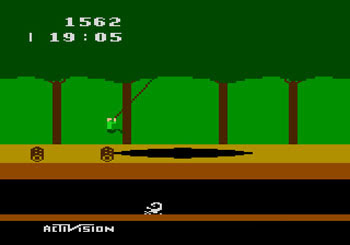 I grew up in the 80’s, and I cut my gaming teeth on the Atari 2600. Back then, the vast majority of games had no “ending”. There might be a set number of levels – usually no more than 3 or 4 – but after finishing those the game would loop back to the start, becoming more difficult in the process. Your only real goal was a high score. You were never truly finished with any game, unless it was so bad you just didn’t want to play it again. Things progressed, of course, and that’s not a bad thing. 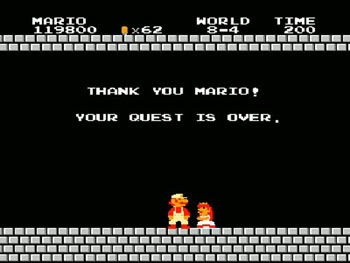 The first game I remember playing that had a true ending was Super Mario Bros. The fact that you felt like you were going somewhere and had a final goal to reach was something that really stood out to me at the time. That alone made the game feel extremely advanced. Still, I can’t tell you how many times I rescued the princess in that game, because doing it once just wasn’t going to cut it for me. Fast forward to today. If a game takes 6 hours or less to reach the end credits, we consider that short. 10-15 hours is the average for most action & shooter games, and RPGs clock in at 40+ hours easily. Most games can no longer be beaten in a single sitting, so replaying them requires more of a commitment. Worse still, with a steady stream of new games releasing it quickly becomes a matter of “Do I want to replay something I’ve experienced once already, or see something completely new?”. And with many gamers having a selection of unplayed games in their collection, it can be very difficult to justify replaying something over starting one of those untouched games. Which all brings us back to the original question – what does it really mean to finish a game? The answer is whatever you want it to mean. For most games, if I say I’ve “beaten” or “finished” it, I mean I’ve played through the main campaign to the end and have watched the credits roll. Occasionally I’ll feel compelled to 100% a game, which for me means getting all of the trophies/achievements it has to offer. But I don’t feel like that’s necessary to say a game has been beaten. If you feel differently that’s fine, because in the end it really doesn’t matter. As I get older, I’ve found myself becoming less and less inclined to stick with a game I’m not enjoying just to say I’ve beaten it. In my youth, I rented far more games than I ever owned. If I rented a dud, I might be compelled to keep playing it to try to wring some enjoyment out of it because I was committed to it. I didn’t really have anything else to play – the next weekend, I would get to try my luck again at the rental store, but for now, this was it. But I don’t have that problem anymore. Today, I have far more games than I have time to play them, so it simply doesn’t make sense to waste that time on a game I’m not enjoying. I’m much better off cutting my losses and moving on to something I’ll enjoy. In that case, I’d probably trade or sell the game I wasn’t enjoying – and that still lowers my backlog by one. Only this way, I don’t have to suffer for the bragging rights.